The Aquila Minstrel Banjo strings are very true to the sound of gut strings. Prior to using Aquila I used actual gut strings that were custom made for me at $50 a set.Thankfully, I now have Aquila for both sound quality and price. I have been a fan of Aquila strings for some time. 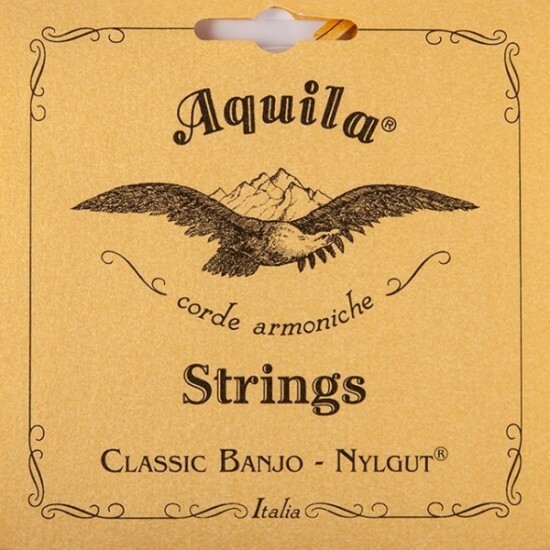 I do instrument repairs and have found the all Nylgut Aquila string sets to be an excellent match up for vintage, spun over pot banjos. I started using them when they still came packaged with a wound 4th string, some time ago. Those sounded great but the wound string wore out very quickly. They then came out with an all Nylgut set, which solved the 4th string issue. Since that time the packaging and formula has changed a few times but with little or no support from Aquila to educate consumers or retailers about the changes. There is some confusion, which I could not get answers about, with packaging and string type. Some packages say Super Nylgut, some say New Nylgut and some just indicated as Classic. I did not know exactly what would be in the packages that I ordered and the retailer couldn't tell me for sure either. This is the reason for only a 4 star rating. The original strings and the earlier sets with the wound string tended to stretch... a lot. They took several days to settle in but the sounded great. I believe that the Super Nylguts where an all Nylgut set made from a new formula that stretched up fast and stayed there. They where Tan in color and also sounded great. My recent purchase with Strings by Mail offers sets that say New Nylgut on the packaging. I thought I was getting the Tan strings but that was not what I received. The advertised image had New Nlygut on the package but the string packages I received are different and did not say New Nylgut. The friendly Strings by mail rep tried to find out more for me but came up short on answers from their source. I had to just try them to find out for myself. Turns out that the strings I received are very similar to the Tan Super Nlygut strings and stretch up fast, they are White in color. I believe but do not know for sure, that these strings replace the no longer available(?) Tan Super Nlyguts. If your confused, so am I. I wish Aquila would do a better job of Rep and customer education. These strings also sound great and are a good fit for vintage 5 strings but I wish Aquila would keep us informed when they make changes. This is the first time I have used nylon strings. I purchased an electric pickup for my banjo and didn't like the sound it produced so I went to nylon strings. They sound much better. For those of you who are using nylon strings for the first time, make sure you tie the loop in a bowline hitch to prevent slippage. P.S. you will have to retune quite often the first week. I just tried these on an old 19th-century banjo. Previously, I'd been using nylon guitar strings, but I wanted to see if strings designed for use on a banjo would make any difference. Short answer: I think it does. These strings seem to make a crisper sound than the guitar strings. These strings stretch -- a lot! When I first put them on, I thought I'd be re-tightening them forever. They settled down after a day or two though. I've read elsewhere that they ought to be tightened slowly initially. Whether that actually matters or not I don't know, but I didn't rush the process. Another detail is that these strings have no end termination: no loop, no ball. You have to tie them to the banjo tailpiece. I used a timber hitch, which I believe is also used to attach nylon guitar strings to classical guitar bridges. At any rate, it works. I like the way they feel. They fret well, and they feel good for frailing. I deduct one star for lack of string terminators -- loops or balls -- but that's really a minor quibble.